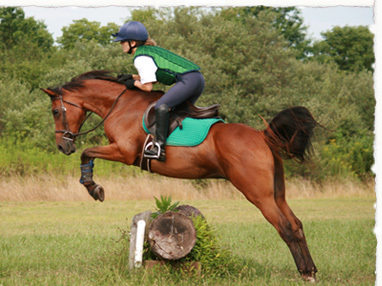 In a modern eventing competition, commonly known as a “horse trials” or simply as an “event,” horse and rider compete in a three-part test, each part called a “phase.”’ The three phases are Dressage, Cross-Country, and Stadium Jumping. Competitors enter their horses in different levels based on the horse and rider’s ability and past performance. At Painted Dreams Farm, riders have the opportunity to train in all 3 phases, and participate in everything from un-rated schooling events, to more competitive rated events. There are levels for everyone, beginning at the un-rated “Starter” division. These encourage young riders and those new to the sport of eventing. They are untimed, and jumps are very low. Dressage tests at this level are walk/trot. For those not interested in competition, students can still sign up for cross-country lessons that we have throughout the season. It’s a fun way to get out of the equitation ring and try something new! Contact us today to Join the Painted Dreams Farm Eventing Team!